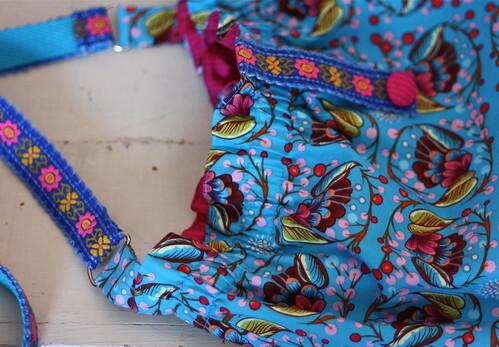 Welcome to Week 27 of the One Yard Wonders Sew Along! 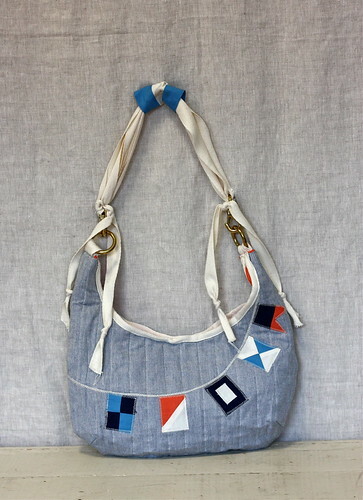 Melissa chose Moda Cross Weave Blue White and scraps from Pink Chalk Fabrics Bits & Pieces. Please note that the text for this pattern piece is upside down. The directions were easy to follow and the size of the bag is not too big and not too small…just right. Melissa made a few changes to make the bag right for her. 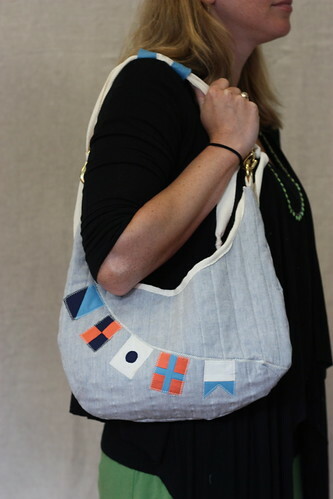 Instead of doing circles she made nautical flags. Flowers or letters would be cute as well. The bag opening was made a little bit wider so the bag part that attaches to the strap was smaller and would fit her ribbon better. Melissa decided to add a lining and 2 pockets for organization. Closer magnets were attached to the lining instead of making the small squares. With the addition of the lining, she didn’t have raw edges to bind inside of the bag. 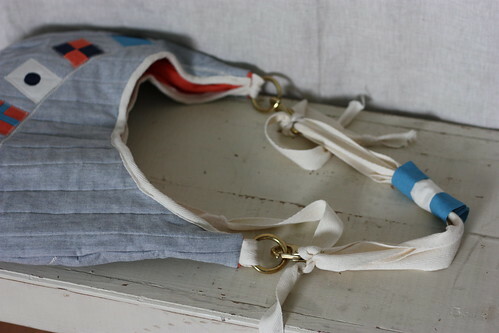 She did bind the opening of the bag making sure that both the outside quilted fabric and lining were secure in the binding. Melissa shopped the local hardware store for brass nautical rings and such. Rope would make a fabulous handle too! Janis selected Anna Maria Horner Loulouthi Curated Bloom Fun Blue and Patrick Lose Mixmasters Monochromatix Fuchsia. The directions call for four pieces 18 X 22. Janis chose two 1/2 yard cuts of fabrics. 1/2 yard cuts are not big enough for both the bag and ring tabs so she cut a 3″ wide strip from each fabric and then cut out the four bag pieces with what was left over. She ended up with two pieces 18 X 20.5 of each fabric. The narrower width is not noticeable and did not affect anything later. Instead of using a metal ring at the base of the 6″ decorative strap a button covered with the lining fabric was placed at the end. 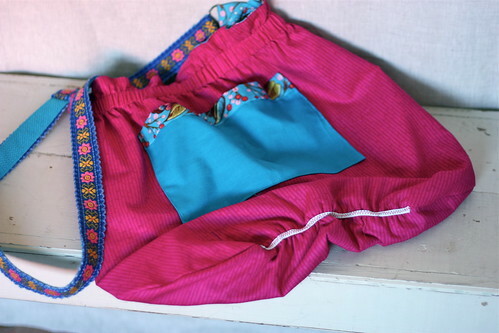 Before assembling the two lining pieces Janis added a couple of pockets using fabric from her stash. She trimmed the pockets with fabric left over from the Ring Tabs. The instructions call for 1/2 inch wide elastic. Janis didn’t want 1/2 wide elastic showing. Clear elastic was tried but it didn’t shrink back to size. She decided to use a very stiff 1/4″ elastic that recovered much better. The narrower width doesn’t show as much. Another option would be to make a casing for the elastic. 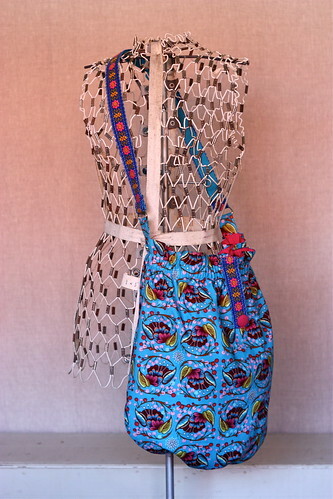 The Scrunchie Bag is a bright, fun, summer, carry everything, beach bag!